Figuring out what these errors mean and how to fix them can be a real challenge. 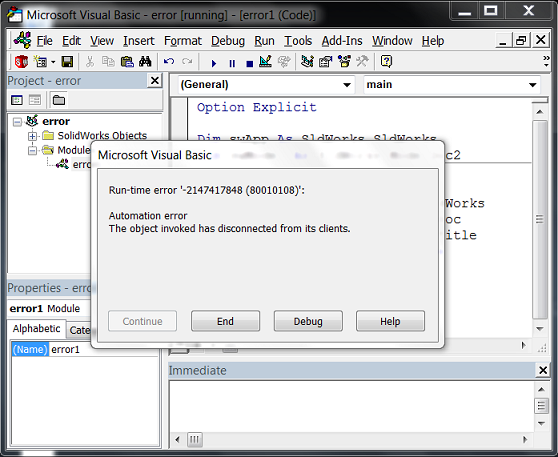 That’s why I created a free PDF, VBA Debugging Tips for SolidWorks API Programmers, that addresses each of these errors—their causes AND their solutions. This PDF also covers basic debugging tips that will be helpful for those new to SolidWorks API programming. You accidentally killed the pointer you were intending to use. For example, if you closed out a model and then tried using the IModelDoc2 pointer to that document that you had previously obtained. You are using a method incorrectly, so that the interface you thought was going to be returned was never actually returned. For example, if you use IAssemblyDoc::AddMate3 to create a concentric mate between two planar faces, the API call will obviously fail to return the IMate2 object. Therefore, when you try to later use an IMate2 member with the variable that you thought contained an IMate2 object, you get this error. In conclusion, I think we can all agree that the least enjoyable aspect of programming is debugging. Reduce the time you’ll spend debugging by using my free SolidWorks API debugging PDF and also by taking advantage of our free SolidWorks API training. Lastly, please let me know in the comments below of any other errors that you think I should include in the PDF.